This small duck has a bright cinnamon head and body and a red eye. The pale blue forewing patch is the best field mark of a cinnamon teal, as drakes are usually in eclipse until January or longer. Their small size and twisting, turning flight gives the illusion of great speed. 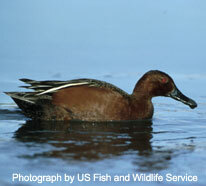 Cinnamon teal have an average length of 16 inches and an average weight of 15 ounces. 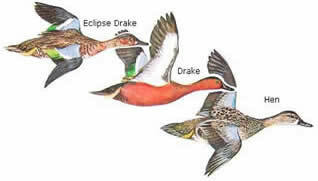 Cinnamon teal can be found in all 4 flyways during migration. In the Pacific flyway, cinnamon teal are far more common than blue-wings. Cinnamon teal are extremely rare visitors to South Carolina. Cinnamon teal are found in freshwater wetlands including marshes, natural basins, reservoirs, slow streams, ditches, and stock ponds. They tend to prefer areas with abundant emergent vegetation. These teal are omnivorous, consuming seeds, aquatic vegetation, aquatic and semiterrestrial insects, snails, and zooplankton. Cinnamon teal arrive on the breeding grounds already paired up. They build the nest below matted, dead stems of vegetation in order to completely cover the nest. The female scrapes a depression and lines it with dead grasses. She then lays 4-16 creamy white eggs. Drakes have a whistling peep, and hens utter a low quack. They are more vocal than most ducks. 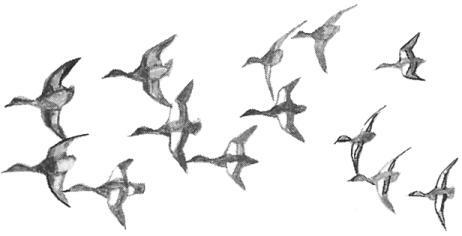 The small, compact flocks commonly fly low over the marshes, and often take the hunter by surprise. These teal are among the first ducks to migrate each fall, and one of the last in the spring. Primarily aquatic, but still agile on land. Territorial males actively defend females and nesting areas. Usually found in small flocks in the summer but can be found in large flocks during the winter.